For California Forward, 2015 was an important and productive year. There has been a continued easing of partisan gridlock, strengthening of fiscal trends and more progress on restructuring of government authority to better align with the state's size, diversity and complexity. The California Economic Summit is a year-round, regional collaboration across California. This year it focused on what it called the One Million Challenges---the need to create one million more skilled workers and build one million more homes in the next decade and to conserve one million acre-feet of water every year. Hundreds of Californians have been working on these issues throughout 2015. Four hundred people came together in the Inland Empire to refine strategies on how to attack these issues, an event that was called a huge success by those who attended. CA Fwd CEO Mayer served on the California Community Colleges Task Force on Workforce, Job Creation and a Strong Economy, a statewide effort to better use the Colleges to close the skills gap. CA Fwd has been collaborating with the Task Force for the past year as it developed a number of reforms to align the state’s training and education programs with what employers need in our fast changing economy. The Community College Board of Governors has passed ALL those reforms and implementation will begin in 2016. 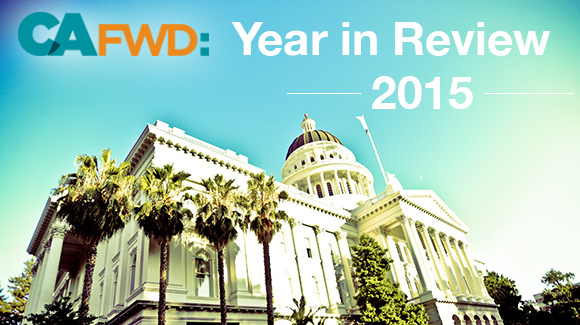 Since its inception, CA Fwd has worked on reforms designed to improve democracy in California. We believe (as most Californians do) that for democracies to work, elected leaders need to be responsive and representative, and voters must be able to hold elected officials accountable for results. A troubling trend of a continuing decline in voter participation in California must be reversed. The Legislature has been looking at reforms to make registration and voting easier. Thanks to a research grant from the James Irvine Foundation, CA Fwd has launched the Election Funding Project to provide an understanding of how elections are financed in California counties and other states, as well as to create a list of options for counties to sustainably fund elections over the long term. CA Fwd also continued its work promoting the importance of technology-enhanced government through open data. Good open data policy can lead to more accountability and efficiency, which is why CA Fwd held an Open Data Summit in Sacramento in March. We will continue to work with like-minded legislators and state officials who believe that technology has the power to transform government -- to promote job creation, to make services more cost-effective, to increase public involvement and understanding, and to enable greater accountability for results. When Governor Brown announced two major offensives to put more decision-making at the local level in criminal justice and education, CA Fwd saw an opportunity to jump in and work with local decision makers to implement these reforms. CA Fwd has worked with county agencies to develop comprehensive community correction models. CA Fwd promoted best practices, helped counties to identify ways to expand drug treatment, mental health and health services for released offenders. CA Fwd’s expert team of public service veterans is now working with select counties to use data-driven models to develop cost-effect policies and programs. Read our story on the work to use data to reduce jail overcrowding in Riverside County. Since the state enacted the Local Control Funding Formula, CA Fwd has worked with the California School Boards Association to build the capacity of local school districts and county offices of education to transform educational outcomes. A collaborative of 16 school districts is learning from each other to improve public engagement and the use of data to deliver better results. It’s been a busy and productive year on this project, which has attracted statewide attention this year. Earlier in 2015, CA Fwd also helped convene The California Awards for Innovation in Higher Education Showcase in Sacramento in Sacramento which highlighted campuses that have innovated to significantly increase the number of bachelor’s degrees awarded, allow students to complete bachelor’s degrees within four years, and ease transfer throughout the state’s education system. An exciting, important (and busy) year looms for CA Fwd, our partners and people interested in making government work better for the people it serves. We plan to keep adding to our list of accomplishments.